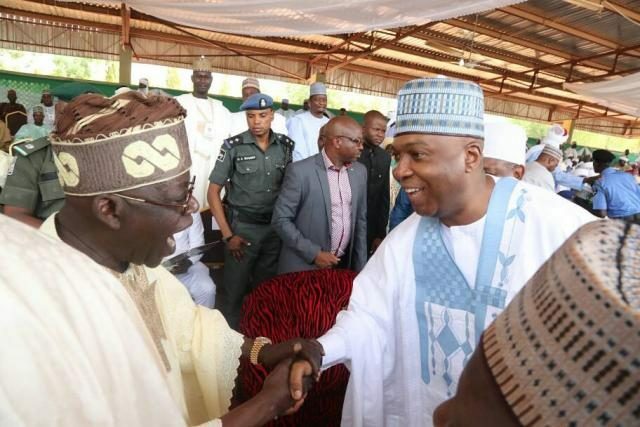 The President of the Nigerian Senate, Dr. Abubakar Bukola Saraki has said the insulting statements made against him in Ilorin today by former Governor of Lagos State, Bola Ahmed Tinubu and the National Chairman of the All Progressives Congress (APC), Adams Oshiomhole were expression of their frustration over the imminent loss of their party in next Saturday election. “They came to Kwara State to hurl insults at me and my people, instead of explaining to the people what they want to do differently and what contributions their flag bearers and other leaders in the State have made to our various communities to justify the people shifting their loyalty to their dying party. They promised nothing concrete that will improve the standard of living of the people and provide infrastructure. “As for Tinubu, we have never expected any good words from him. All his life, he will continue to belly ache and nurse grudges over my opposition to the Muslim-Muslim ticket idea in 2015. As far as he is concerned, I stopped him from realizing his ambition then. However, I believe my action then and now is in pursuit of national interest. Again, I supported President Buhari in 2015 because I believe he could make a positive change. I left the party when I realized he lacked the capacity and the desire to make any change. Tinubu on his own part said though he agreed with me about my assessment of the man, he would continue to support Buhari even if the man had to govern from the hospital stretcher because that is the way he ( Tinubu) could become the President in 2023. So, while my position is premised on national interest, Tinubu’s is based on his personal interest and ambition. Now that Tinubu’s new speciality is to hurl insults at people like former President Olusegun Obasanjo and former Vice President Atiku Abubakar, focusing on me today is okay if it will help him feel good.